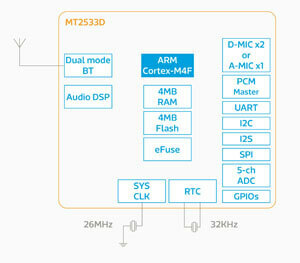 MediaTek announced the availability of the MT2533D, a highly integrated chipset for smart, connected headphones, headsets, earpieces and hands-free systems, at the 2017 Consumer Electronics Show (CES). Although designed for wireless headphones and in-vehicle hands-free systems, the MT2533D chipset also can be used in stand-alone sports headsets or travel earpieces thanks to local MP3 playback, making music playback possible without the need to pair a smartphone, said MediaTek. The MT2533D combines an audio analog front end (AFE) and digital signal processor (DSP) with an energy-efficient ARM Cortex-M4 processor, 4 MB memory (PSRAM and flash) and dual-mode Bluetooth (2.1 and 4.2 Low Energy) radio. To support applications that need advanced audio management, the MT2533D integrates a DSP that comes with 128 KB IRAM, 250 KB DRAM, and 96 KB SRAM for various speech enhancement algorithms. This DSP features native Dual Microphone Noise Reduction (DMNR) technology and supports third-party software for a voice wake-up command. It also supports A2DP, HFP, Advanced Wireless Stereo, and MP3 local playback. Other features include display and camera interfaces, and it can work with additional connectivity, such as Wi-Fi, using the SDIO feature. "MT2533D, with its combination of low power and rich features, is the ideal chipset platform for product designers of smart headphones, wireless headsets and hands-free solutions," said JC Hsu, corporate vice president and general manager of New Business Development Business Unit at MediaTek, in a statement. "The combination of advanced audio processing technology with low-power computing capabilities opens up new possibilities for innovation in the smart headset market." Based on FreeRTOS, with additional open-source modules (source code available). Development and debugging in ARM Keil μVision, IAR Embedded Workbench and GCC. Availability: The chipset will be available in Q1 2017. Resources: More information is available at http://www.mediatek.com/products/wearables/mt2533 and http://labs.mediatek.com/2533. Developer documentation and tools will be released via MediaTek Labs in Q3 2017.